Pilobolus (Shotgun Fungus) Kit (with Perishables) is rated 4.3 out of 5 by 3. The popular "shotgun" fungus, Pilobolus crystallinus, grows on herbivore dung. Herbivores will not graze near their own dung, so the spores must be propelled beyond this "zone of repugnance." The sporangia bend toward the sun and "shoot" their spore mass in that direction. Students grow Pilobolus until sporangia are mature. Then they place the culture inside a container with a small hole to allow in light. The sporangia will all be propelled toward the hole. Requires about 10 days to conduct the exercise. The adaptation of this interesting fungus to its unique habitat is explained in the teacher's instructions. 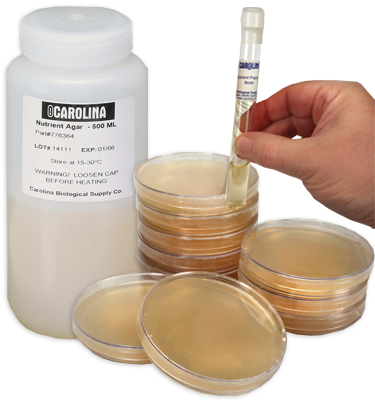 Keep agar plates refrigerated until use; do not freeze. ** Kit and perishable components will ship separately and may arrive on different days. Rated 5 out of 5 by Fatuma Umari from Wonderful I ordered a kit, but a piece was missing so I called customer service told them my problem and they shipped it in two days. Wonderful and fast service. Rated 3 out of 5 by GSmom from the kit covered all safety precautions once we finally got the kit after almost 2 weeks, the group was able to complete the project. The only downfall was the time to get the project delivered. Having all of the required safety precautions included in the kit was a definite plus, it made the experiment go so much faster with all the precautions taken care of. Rated 5 out of 5 by kg85 from Great product Everything in this kit worked exactly as promised and the students really enjoyed the exercise.